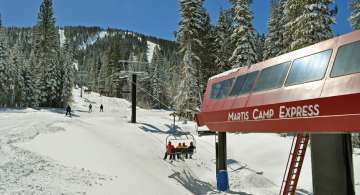 Martis camp has been one of the most acclaimed and successful new mountain subdivisions since 2006. The subdivision features 653 luxury properties. Martis Camp real estate has lots averaging over an acre each with some up to five acres. Each luxury homesite features vigilant landscaping and the preservation of key natural elements. The subdivision has received accolades for its success. The Golf Course has been featured as one of the top new private golf courses in the country and the US Junior Amateur along with the Pacific Coast Amateur were played at the course in 2012 and 2013. The subdivision has also been featured in national magazines highlighting the project as one of the best in the country. Owning Martis Camp real estate indicates you have sought out the best that a mountain lifestyle can offer. Park Pavilion & Sports Fields: croquet, bocce ball, volley ball, basketball courts, and lacrosse, soccer, softball or touch football fields. Aerial Adventure Park With four different courses you can gradually spread your wings from beginner to advanced, eventually kissing your fear of heights goodbye as you zip 20-feet above the forest floor. There’s even a “terra firma” course for kids 4 and under. The development features estate sized lots with spacious setbacks and a variety of mountain architecture to mirro the vastness of the Lake Tahoe terrain while ensuring maximum privacy. Tahoe’s most renowned home builders have crafted an extraordinary array of luxury custom homes at Martis Camp that fully embrace the Lake Tahoe lifestyle. The collection of luxury homes for sale includes cabin style homes to grand estate homes. Martis Camp real estate offerings have redefined the way families experience Tahoe. With a mix of estate lots for sale, smaller cabin lots and custom homes, Martis Camp sets the standard in Lake Tahoe luxury real estate. We’ve helped over 2,200 families find their ultimate vacation home or primary residence and know Martis Camp real estate very well. Contact us to become another Davis Yoder Group satisfied customer. It’s a premium club made up of people who have sought out the best and found it. What do owners say about Martis Camp? "“This is our third property we have sold with them. We have had very good experiences with Davis Yoder”. "